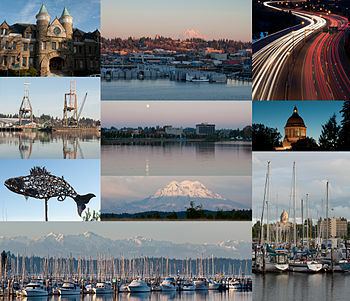 (From top left to bottom right) Old Capitol Building, East Olympia, Interstate 5 at the junction of U.S. Route 101, Port of Olympia, Downtown from Capitol Lake, Washington State Capitol, Salmon sculpture, Mount Rainier, Olympic Mountains and Swantown Marina, Percival Landing Park. ↑ "National 2010 urban area file containing a list of all urbanized areas and urban clusters (including Puerto Rico and the Island Areas) sorted by UACE code". United States Census Bureau, Geography Division. Archived from the original (TXT) on May 16, 2012. สืบค้นเมื่อ November 21, 2012. ↑ "Population Estimates". United States Census Bureau. Archived from the original on October 19, 2016. สืบค้นเมื่อ June 15, 2016. หน้านี้แก้ไขล่าสุดเมื่อวันที่ 7 กุมภาพันธ์ 2561 เวลา 22:15 น.